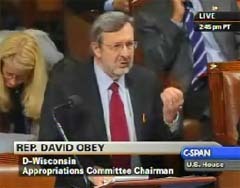 As the House debates the federal stimulus bill, Wisconsin Democrat, Rep. Dave Obey says Republicans have no cause to complain that they&apos;re input has not been sought. "If someone says I&apos;m sorry I was shut out, but it was they who turned the key in the lock that kept them on the outside, that certainly wasn&apos;t our fault," says Obey. The Wausau Democrat chairs the House Appropriations Committee, and says he&apos;s been willing to listen to Republicans. "I sat down with the ranking member . . . and discussed in general terms where I thought the bill was going, and again urged that we be given any information about what program levels were appropriate," says Obey, adding that he "got no real indication of interest." The House is expected to vote by this evening, on the $825 billion economic stimulus package.